The growth of the too big to fail bank is something that is modern to this era. In the 1990s there were fewer than 40 institutions that had total assets above $20 billion. In the late part of the 1980s and 1990s this number was below 20. 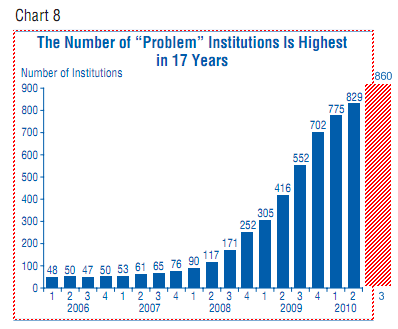 The peak was reached in 2005 with 55 institutions having more than $20 billion in total assets. That number has fallen in recent years because of the crisis yet we have a handful of banks that control most of the nation’s banking assets. 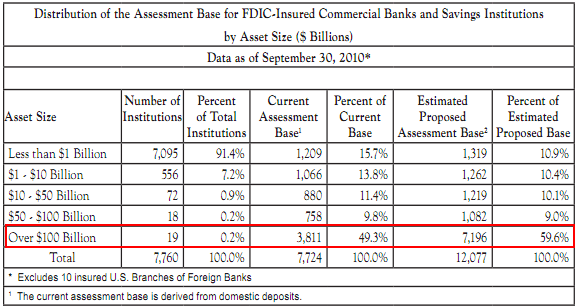 The total U.S. banking system as of today supports over $13 trillion in total assets. The FDIC insures these deposits with a deposit fund that is negative so it might as well be supported by pure faith. What makes up most of these assets are residential and commercial real estate loans. As we have discussed banks have yet to come to terms with the reality that many of these loans are not worth what they claim they are. First, let us look at the growth of too big to fail. 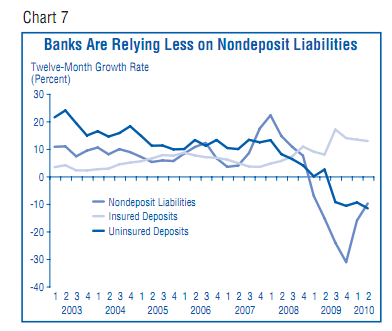 But didn’t you say smaller banks were doing better than bigger banks? They are for the most part but many of these smaller banks don’t have the same kind of relationship with theFederal Reserve and don’t have the leverage of say a JP Morgan or Bank of America. Looking at recent banking profits the bulk of the money being made isn’t on a strong U.S. bank customer, but by speculating through their investment units around the world. This can take the form of speculating in commodities, stocks in emerging countries, or anything else. When you can borrow at zero percent it isn’t too difficult to turn a profit but it is certainly not benefitting the American economy especially the working and middle class. At the same time, is this even something to be happy about? 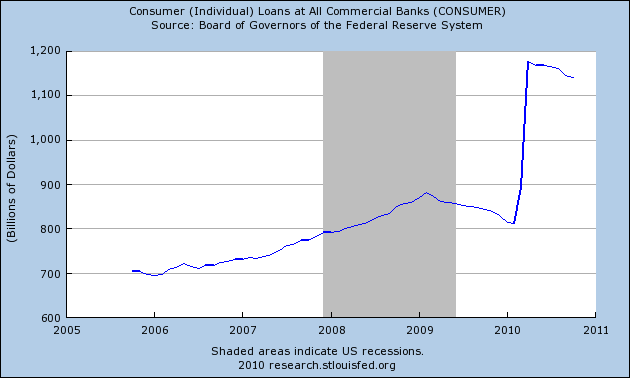 The American consumer is over leveraged so adding more debt doesn’t seem to be the solution here. Banks can only make these loans because the Fed is determined to dilute the U.S. dollar and hopefully, in their eyes at least, inflate away current debts including horrific bets on commercial real estate. Many observers agree that the current banking system is insolvent and the only thing keeping it afloat is by suspending accounting laws that require mark to market. We have seen this translate into banks moving slowly on bigger priced foreclosures on residential properties but also commercial buildings. 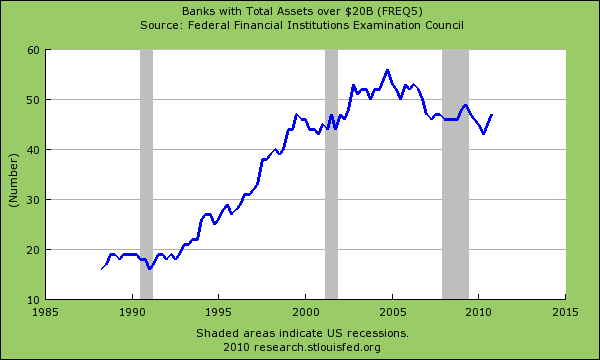 The banking system problems of 2007 are still largely present as we end 2010. The only difference now is that they have managed to link up their failure to the U.S. dollar directly. This is why the Federal Reserve is embarking on the quantitative easing path. Mega banks need to be broken up and a separation between investment and commercial banking is an absolute necessity. It is incredible that no politician (or group of) has taken this up. If you recall, the bailouts were largely opposed and the public railed against their constituents. The first vote did not pass the bailout and then politicians used fear and went ahead anyway. This was not the will of the people. Also, it is insulting that nothing was attached to the bailout funds. For example, a stipulation could have been put to break up the banks as a condition of the bailouts. Instead a blank check was given and here we are back with the same system of mega banks and no protection for the people. If our politicians were in a contest for best negotiator they would come in absolute last. Then we hear the Federal Reserve saying it would have been 25 percent if it weren’t for the bailouts. Really? What would it have been if the Fed actually did its job and prevented the housing bubble from taking place to begin with by regulating and enforcing laws against the banks? Do people really trust these guys?